Two second half goals were enough to see Lewes progress through to the next round of the FA Trophy on a chilly afternoon at Ashford Town, reports Stuart Fuller. Manager Darren Freeman made a number of changes from the midweek win at Whitehawk, with Luke Blewden, Stacey Freeman and James Hammond dropping to the bench, replaced by Dan Darbyshire, Declan Appau and Frankie Chappell. 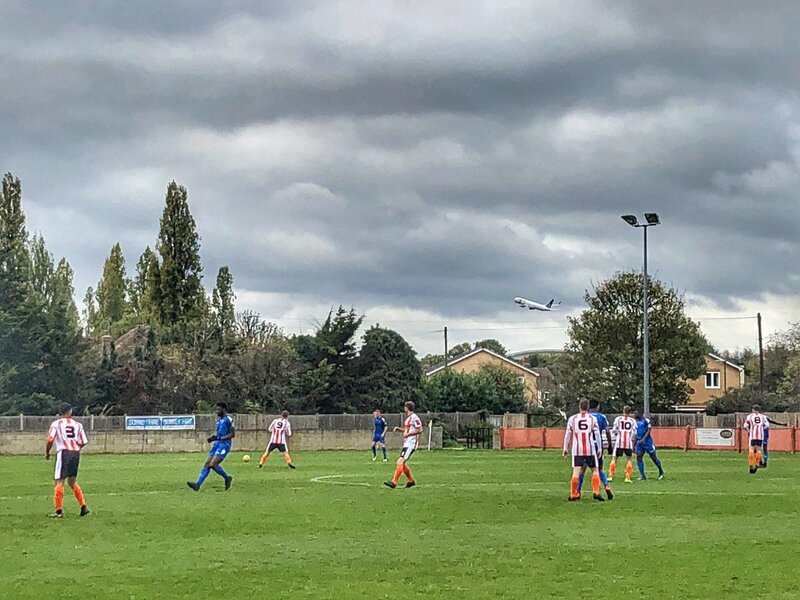 On a chilly afternoon and a bobbly pitch, the opening phase of the game wasn't pleasant on the eye, with most of the crowd distracted by the planes departing Heathrow airport next door. Chances were thin on the ground although it was no surprise that the hosts took the lead in the 25th minute when a free-kick was allowed to reach the far post and Adam Baigent stole in unmarked and made contact with the ball and turned it into the net. The goal shook the Rooks into life. Harry Read broke the Ashford offside trap down the left and sent a cross to the far post where Ronnie Conlon got his head to the ball but whilst former Horsham keeper Daly was beaten, the ball smacked against the crossbar. Five minutes later Omarr Lawson had a great chance to equalise when the ball fell to him on the edge of the box but his shot flew wide of the mark. Freeman decided to change his approach at the start of the second half, replacing Michael Dome-Bemwin with striker Marcus Elliott and the Rooks immediately looked more threatening. However, it was the home team who should have extended their lead on the hour mark when a scramble on the goal-line somehow stayed out of the net. Sam Karl was introduced to provide more pace down the flanks and he created a great chance for Marcus Eilliott which was blocked and the ball fell to Omarr Lawson who sent the ball towards the far post. Whether it was intended or the ball found a thermal current, the ball sailed over the head of Brannon Daly and into the corner of the net to equalise. Based on our cup form this season few would have been surprised if the game finished all square but with five minutes to go the Rooks had their winner. Jonte Smith received a kick in the face 25 yards out and after some lengthy treatment by birthday-girl Debs Adams, Declan Appau superbly curled the free-kick around the wall and into the net. It certainly wasn't a classic but the final whistle brought relief that the Rooks would be in the draw for the next round. After the game manager Darren Freeman was understandably relieved to have won a cup tie at the first attempt when he spoke to Barry Collins. The Rooks return to Bostik League Premier Division action on Wednesday night as they go looking for a fifth consecutive win when they host Harlow Town at The Pan, kick off 7:45pm.